This month’s buyer’s guide sees us check out the Fendt 820, a rare but highly sought after tractor. Fendt’s 820 arrived in 2006, as a direct replacement for the previous 818 model. Sitting at the top of a two-model range, its introduction coincided with the development of EU Stage 3 emission compliant engines, and an adjustment of model numbers to identify maximum engine power. Stage 2 model numbers referred only to rated power. The 820 is actually identical to the 718 of the same era, complete with heavier duty 10-stud rear axle, and differed only in its power and level of specification. For the UK market, the 820 came well-equipped. Standard specification included four spools, comfort front linkage, cab air suspension, super comfort seat, external spool buttons and generous worklight package. The few additional options included front pto, Evolution seat and different wheel and tyre choices. As the best selling tractor in the Fendt range over its five-year production run, the 820 earned itself a big reputation as a lightweight and powerful workhorse. And its stepless Vario transmission continues to be the jewel in the crown, offering infinite adjustment of travel speed from 0.02-50kph forward, and 0.02-40kph in reverse. There is no power boost – what you see on the bonnet is what you get. For the 820, it was 205hp from a four-valve, Deutz 6.06-litre six-pot engine. As a Stage 3 engine, it got cooled external gas recirculation (EGR). Combined with the Vario transmissions and cruise control settings, it had the ability to deliver on fuel economy too. While the engine is not considered a weak point, low-houred models doing light duties are be more likely to give trouble with the EGR system than those having done 10-12,000 hours of hard labour. Mark Peters believes there is no need to run from a high-houred example, particularly if it has got comprehensive proof of being serviced according to the maker’s requirements. For the engine, that means 500-hour oil changes. Broken exhaust manifold studs – as seen here – are considered a stress relief point for dealing with heat, and this is a cheaper alternative to cracking the tall manifold which carries the turbo. Cooling pack is easy to access and the box-type layout makes each radiator element easy to clean. Front axle suspension is largely robust, and any failing in ride comfort is likely to need a nitrogen accumulator replacing – it will manifest itself with a hard ride. Front pto is optional and the majority of models came with the comfort front linkage, capable of lifting over four tones. Double-acting capability makes it easy for those swapping front wheels. If serviced correctly over its life, there should be little to fear from the stepless Vario transmission, says Mark Peters. There are over 100,000 Varios in work. Pressure filter changes are required every 1,000 hours and transmission oil and suction filter changes are needed every 2,000 hours. Vario transmission does not share oil with the hydraulic system, but does share it with the braking system. Abused brakes can cause filter blockages, though a filter bypass will allow the tractor to be driven – so pay close attention to any fault codes on the dash and seek immediate rectification. 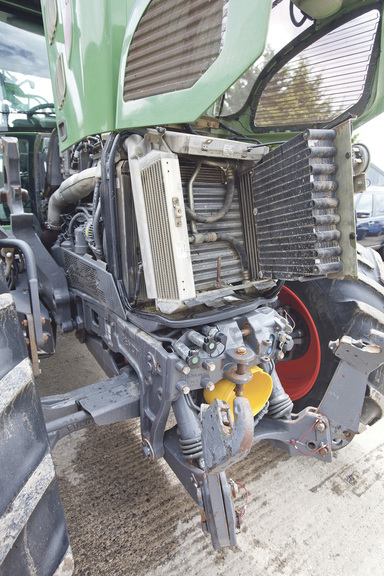 A hefty 336-page operator’s manual contains all the information you will need to look after the tractor, including servicing requirements and fault code identification. The Vario’s field and road settings are accessed through a range-change, and this should only be selected when stationary. On-the-move shifts could lead to damaged synchros along with more fault codes and eventual failure. Should the Vario fail, it will not be stripped and repaired by the dealer. The Vario cassette will be removed and sent back to the factory for a full inspection and rebuild at a cost of about £7-8,000. Though it will come back with a two-year warranty, says Mr Peters. 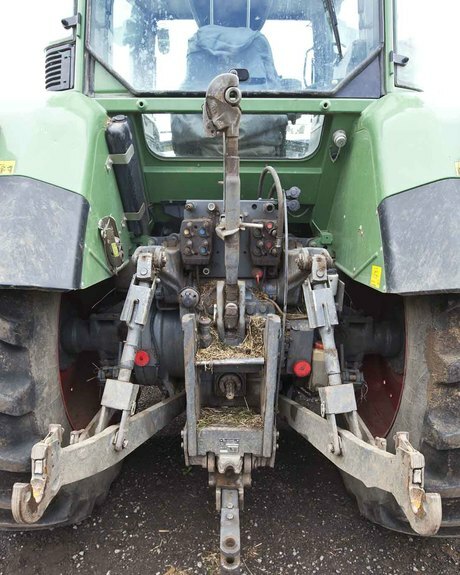 The back of the tractor is equipped with four spools that can be independently configured for flow and pressure, plus a nine-tonne lift capacity and flange-type pto. Adjustable settings for Cat 2/3 hitches and quick release stabilisers are all part of the standard specification. 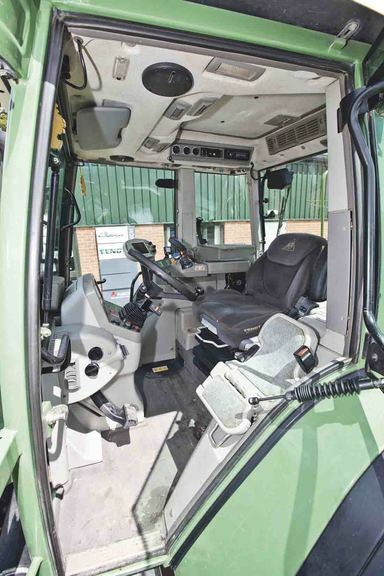 The 820’s cab is perhaps its weakest point – the frame is one which was handed down from the early 500 and 800 series tractors when they were first introduced in 1994. This dated design, old-fashioned dashboard and opening front windscreen continues to deliver functionality – the latter makes the cab noisier than it could have been. There is space enough, but is poorly laid out. That said, the cab interior wears well, as can be seen on this 10,500 hour, 2009 example. Button pads are robust, though the Vario drive lever can suffer from broken plastic buttons. The entire lever face can be replaced for relatively small cost. The firm’s Tractor Management System made Vario tractors much simpler to operate, with a standard interface throughout. While the screen is small by current standards, it does offer a host of information and adjustment. Evolution seat, while optional, offers much higher levels of comfort for the operator. Every electrical system on the 820 does have a manual back-up system available, so there is always a way to get the tractor moved in the event of a system failure. The operator’s manual details how to get the tractor moved through emergency operation. Mr Peters adds that Fendt’s continual programme of development means tractors which are seen by the dealer network do still get software upgrades. But there are few bargain 820s to be had – Fendt’s stiff residuals combined with a desirable model means you will be using the tractor as a bank account. “While a Fendt might be the most expensive tractor you’ll ever buy, it will be the cheapest tractor you’ll ever run,” he says.